Why Preschool in Suburbia Gets an A+ April 14th, 2017 : Divalysscious Moms – Fabulous events for expecting, new moms, and families in NYC! We get the question all the time—what’s the “right” time to move from the city to the suburbs? The answer? There really isn’t one. Every family is different—different needs, wants, goals and interests. Some are always heading for suburbia, while some think they’re going to settle down in the city forever—but then something changes. When it’s the right time for your family, you’ll know—you’ll feel ready to make the transition, you’ll crave more space, you’ll be tired of the city school system or you’ll just want to start living life in the ‘burbs. It’s that simple, sometimes. But, that said, there are some times that naturally lend themselves to making a move. One of those times? The preschool years. By heading to the ‘burbs in or right ahead of the preschool years, you’ll ease the transition from urban to suburban for your kids and your entire family. Why? Some public, private and charter schools have preK in the elementary programs. By getting your child enrolled in preK, they’ll be able to easily adjust to kindergarten and beyond. And even if your future school doesn’t have preK, chances are at least a few of your child’s preschool friends will head to kindergarten with them. Just seeing a few familiar faces on the school bus, the playground and the cafeteria can make everyone feel more confident and, even, excited for “big kid” school. Preschool and preK tend to have shorter school days, which means more involvement from mom and dad. Chances are, you’ll have tons of opportunities to mix and mingle with other preschool parents at pick up and drop off, class parties, special events and other school activities. Even if you have a nanny or au pair for your preschooler, you’ll still reap the benefits of these connections via weekend and after school playdates, plus plenty of reasons to text or email fellow parents just to check in and make the intro. Around kindergarten or first grade, many birthday parties shift to drop off. But in preschool? You’re going to bring your kid, hunker down and have some cake! These parties are great ways to meet other parents—by preschool, kids are old enough to enjoy the festivities without too much involvement from mom and dad, giving you ample time to make introductions and, even, make plans with your new neighbors. Preschools are great ways to suss out a suburb’s personality. Not only will you have all this exposure to your fellow preK moms and dads, but you’ll also be able to observe key traits and behaviors in the town. Is it a SAHM town, or do the parents head into the city for work every day? Are families into active hobbies—hiking, skiing, paddle boarding, biking? How do they spend weekends and summers? Is it all about organic and local eats? Sports? Dance? Sleepaway camp? While, yes, some of the more selective private schools in suburbia will have rigorous application processes, it’s nothing like city schools. In the city, there’s often competition for private and public preK spots, from lotteries to zoning shifts to endless waitlists. For many families, that’s what ultimately drives the decision to head to suburbia—wanting to avoid the preK or kindergarten application process. There’s no one “right” time to move to the suburbs. But, as many city have discovered, the preschool years are an A+ time to make a move and integrate the entire family into suburban life. Whether your kids are already in preschool or the 3s and 4s are fast-approaching, it’s a great time to consider making the move, and taking advantage of all of these preK perks. 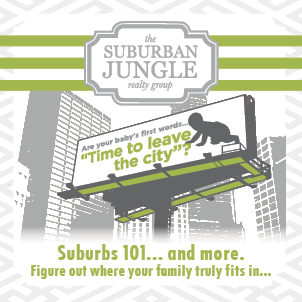 Suburban Jungle is an award-winning firm that specializes in moving families from urban to suburban. The company’s innovative “town first” approach helps buyers find the right suburb for their family based on personality and lifestyle, not just the house. Services are FREE and fully customized to each family and their unique journey. To learn more and to connect with a Suburbs Strategist, and find the place your family truly fits in visit www.suburbanjunglerealty.com and click GET STARTED.